There are an awful lot of adverts for compost tumblers. Some you roll along the ground. Others rotate on a base. Some rotate around a central axle. Still more are cranked with a handle. All suggest that they give you compost more easily and in less time than a bin which sounds very attractive. So, is a tumbler something that you should consider? In 2011 Which? Gardening magazine in the UK compared turning five well-filled tumblers three times a week with turning a traditional compost heap of the same volume once a week (usually done with a garden fork or spade). Surprisingly they found that, while the heap took around ten weeks, tumblers actually took a month longer to create usable compost. A decent tumbler makes turning easier, but if you want compost quickly and are happy to do the work, it appears that you might as well stick with a standard compost heap or bin, as long as it's easy to access the compost to turn it. It's considerably cheaper and gives you more exercise. Of course, lots of us don't turn compost weekly and wait considerably longer than 14 weeks for it, so cutting the time it takes to make compost may appeal. A tumbler must be easy to turn, or you won't bother. Compost tumblers tend to be summer workers. Unless they're very well insulated, cold weather prevents them from heating up fully. There's also undoubtedly a difference between the composts from a heap and a tumbler. It's inevitable because the tumbler doesn't contain worms. Nor can you add worms, because when the temperature rises they can't escape and will die. So, all the good work that worms do in churning material through their guts and adding nutrients is lacking. What you do get is material worked on by bacteria and fungi. It has reached a high temperature, several times hopefully, which should kill off weed seeds and disease spores and will have a looser, rougher character which can be dug into beds or used as mulch. My experience is that it won't be that 'rich uniform crumble' that comes from a well-rotted heap. In fact, at this point some people put it to one side to continue to compost, which then allows worms to move in. There are reasons, though, other than taking the work out of turning, why a tumbler might be useful. If you have a rat problem. It's not the only way to combat vermin, but the right choice of tumbler provides an instant solution: something metal, with the compost compartment held well off the ground without needing large air gaps because the tumbling achieves aeration. Tumblers like these also allow you to compost food waste that is normally taboo—small amounts of meat, fish and fat—as the high temperatures will break them down quickly and vermin are excluded. If you have back problems which prevent your turning the heap. Choose your equipment carefully. A tumbler that you push along the ground yourself is likely to strain the healthiest back. Those which pivot around a central axle carry most of the compost in the bottom half and can be difficult to swing over. The best for a back problem is likely to be one of the more expensive types which is turned via a handle and geared cogs. These take a great deal of effort out of turning. Check whether you can maneuver a wheelbarrow underneath for easy unloading. If you have very large quantities of grass clippings and soft sappy material to compost. Too much of this in a normal compost heap causes anaerobic decomposition, leading to unpleasant smells and sludge. A tumbler, because it introduces air so readily, reduces this problem considerably, although dry material is still necessary. Grass clippings halved their volume in about a week when I turned the tumbler daily. They can then be mixed in, if wished, to a normal heap. A tumbler should always have drainage holes to permit liquid to escape, and this, if collected, provides a nitrogen-rich solution for liquid or foliar feeding. If you have very limited space to compost. It may be worth considering if you have to site it on concrete (fluid will drip into the container you place under the tumbler, rather than oozing out at the bottom). If you enjoy tumbling. I know it sounds daft, but it's actually fun. I trialled a super tumbler — Henchman's Compact Compostumbler (available here in USA) — and can honestly say I loved its high quality construction and ease of turning. In fact, tumbling might get your otherwise reluctant children involved. A three-year-old relative was fascinated by mine and looked forward to more composting at every opportunity. If you want an ultra-fast output. Adverts suggest that you can make usable compost in as little as three weeks and yes, I've done it. It's not a piece of cake, and you should ensure that your tumbler comes with instructions specifically for this. Be prepared. The balance between carbon and nitrogen is critical, so ingredients need to be measured. Moisture levels need to be monitored, as does the temperature. The end result is quite rough, but would be useful as a mulch. 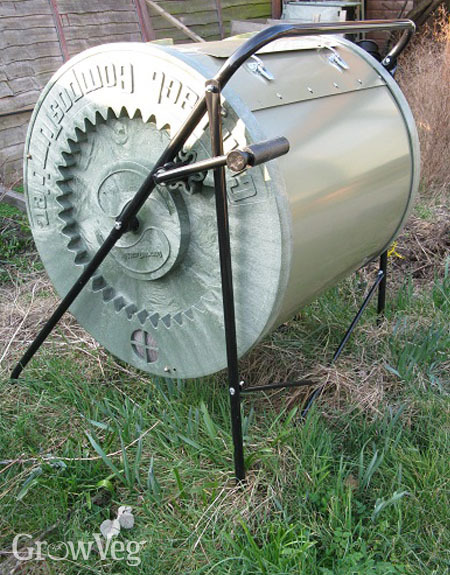 "I recently found a compost tumbler on our allotment recycle site. A bit of tlc on the frame and it is now ready for use. I have no instructions but like the idea of using grass cuttings as we have a lot of these on the site. Would shredded cardboard or paper be suitable as a dry material to mix with the grass and in what proportions? Many thanks." "I have a tumbler, 3 bins, a pile, and a worn bin. I received the tumbler first and could tell after a few months that is would not be sufficient. I too noticed it took longer. My first batch was unimpressive as far as quality but my batch that is ready now looks beautiful and crumbly. The worm bin makes the most beautiful." "I have been considering getting a tumbler. My question is if it's not that nice black rich compost we're use to, how do you know when it's done?" "I have four pallet compost bins on the allotment and three wormeries in the garden and can never make enough compost. As we have a huge pile of grass cuttings on the allotment I would like to put them to some use. If I mix them 50/50 with shredded newspaper/cardboard and tumble would this ratio enable me to put the result straight on to the compost heap without any problems." "Janet, cardboard and paper would be suitable, but shred them up as finely as possible and mix well. As far as proportions are concerned, you can usually allow more "greens" than you would in a normal heap, so try four parts grass to one part shredded paper, but be ready to adjust if necessary, so water if its gets too dry and add more dry stuff if it becomes too soggy. Kim, this is a good question. Compost that has been through a hot composting phase is, arguably, ready to use, but it won't be broken down to the extent that you're used to. You get used to a rougher look and texture. Also, you'll find that the temperature won't rise again on tumbling, though you'll have to be sure that that's not just because the contents aren't moist enough for that to happen. Janet, yes that should be fine, but mix well. I've also found grass and chipped wood (from a home chipper) in a 50:50 ratio produces really gorgeous compost surprisingly quickly. " "Many thanks for your reply Helen." "Don't waste your $$$. Unless you live where you have no space,stick to the pallet pile for all the reasons above." "I had a tumbler on my small patio for a while. I eventually gave up on it because not only did it not really get to temperature or produce a good finished product, it developed a soldier fly infestation (despite repeated cleaning and addition of more and more brown material in subsequent batches) that we couldn't ever seem to get rid of. Because the only place I could situate the tumbler was in our tiny patio enclosure, the larvae found their way into the house regularly. It was gross." "I had a dual tumbler turned by an actuator that my husband created. Turning ever so slowly (1 rotation/ per minute)it was working a treat, although only creating a small amount each time. That was, until the native bees decided to use them as a beehive !!!!!!!! Have gone back to the slow composting again and yes the bees have been removed and the bins are now strawberry pots." "Thank you so much for this information! I'm a new gardener and want to start to compost. I have been put off by the cost of the tumblers. I have the space, dogs to keep the pests away, and physical ability. I'll just stick to building my own. You and those who commented above just saved me $$$. Thank you kindly." "I live in the suburbs. The #1 reason for me was to eliminate rats. My regular compost pile now has the bulky stuff, but the tumbler gets all the kitchen scraps. When I put kitchen scraps in my regular bins, I found rats. I can deal with field mice, squirrels, and rabbits. Rats - no thanks." "If I don't stay on top of my regular compost pile (turn at least every 2 weeks) I end up with a dense matted root system all through the compost. I assume these has sucked away the "good" nutrients plus makes the turns even more difficult. I'm seriously considering making a tumbler just because of these problems. " "My husband actually made a compost tumbler 2 years ago following a video on you tube. Although it wasn't very solid it did do the job for just over a year and we made good compost. We found after about 18 months the material was starting to decay so we decided to buy one online, this time with a steel frame. We did quite a bit of research and found that the easy composter compost tumblers http://www.compostbins.net.au/ were great for our needs. They also come in a colorbond steel so we could choose the colour. If you interested i added the address above." "I recommend recycled plastic compost tumblers. They are great for the environment and they will probably outlive the purchaser." "I use a compost heap. I have it raised off the ground 3" with a 1/4" mesh screen coving the top of this 3" "platform" made with 2"x4"'s spaced 2' apart and framed.I then took your idea of putting 1" PVC pipe drilled out with holes and put through out the pile with the open ends sticking out. They are easy to pull out to turn the pile over. I then use a small 4cycle rototiller with front tines every couple weeks. It takes me less than 4 months to get a great end product. I put grass clippings, garden debris, Mulched leaves, manure, ferilizer, and home scraps in it." "A compoost tumbler would be Ok if you have a small garden but I find a pile works best for me and the quantity of compost I make. In addition I have chickens and they do a great job of scratching it around. My Dad used to use a trench system. Simply dig a trench in the garden and toss in the compostables and cover it. Let the worms do the turning." "Hi Helen... things move on... To get fast compsoting you need to retain the heat. With heat and use of bulking agent (wood chip) you do not need to turn. We'd love you to review the HOTBIN - it changes what can go in and how fast it comes out." "I've a relatively small urban garden and have used a re-cycled barrel tumbling round a central pivot for 35 years; although it doesn't provide for all my needs it uses up all my vege kitchen waste,finely shredded newspaper,lawn clippings,soft garden waste, autumn leaves etc. I do use an activator.I add to it through the year until about September; I empty it October/November and use it as a fairly fine mulch. I start filling it again straight away, turning it through the winter. At 72 I have found it too heavy to turn as all the compost has settled towards the bottom half so today I have invested in one of the more expensive ones with a handle and cogs; a 334 ltr ComposTumbler--I haven't assembled it yet but it looks robust and I'm sure will provide me with what I want just as the old one did! Will certainly be easier to turn!!" "P.S.- I forgot, it doesn't particularly hot so it's absolutely full of warms; eggs must get caught up with the leaf litter I suppose"
"P.P.S -should read 'worms'- didn't check; getting old?" "Hope your tumbling goes well, Ivan. " "As an urban roof top gardener I have long been looking for a way of composting that allows for compost turning without it making mess or being too complicated for urban roof gardeners with busy lives. I thought we could adapt a worm composter, as these usually have a reservoir for the liquid and a tap. But they are so expensive. Maybe a tumbler is the answer. " "You can make your own worm bin quite easily. There are plenty of instructions on you tube. It will only make small amounts of compost but the compost is very good." "Hi, my mum wants one of these for Christmas - any ideas where I can get one from? I'm in South London. Thanks :) C. "
"Charlotte - A worm bin composter or the tumbler kind? The south London permaculture people have a page on making your own: http://southlondonpermaculture.com/gardening.html Try your local council - From a website: Southwark residents can buy a home compost bin, wormery kit or Can-O-Worms at a subsidised cost from the Reuse and Recycling Centre or by arranging a home delivery through Getcomposting.com. Else search online. " "It's 12 months since I started using my new ComposTumbler (see 3rd of October, above). I'm afraid it hasn't been as successful as I had hoped. I followed my usual method (one of the two recommended in the accompanying info. ), adding material throughout the year. Instead of the relatively fine tilth I had before the compost came out looking much like horse manure but not smelling as sweet: it was also rather wet and when some of the larger balls were broken open the material inside hadn't broken down completely - even with the use of an activator. Although the tumbler looks robust the weight of material using the slow method has pulled one of the internal flanges out of shape as well as the holes in the cover for the catches. Some of the screws and fittings have started to rust. I have decided not not put in the leaf fall as I have done before to help lessen the weight - it will have to go to the local tip unfortunately as I have nowhere to put it to turn it into leaf mould. One of the problems is that there are no good drainage holes it largely drains through the joints , which is not enough. I think I shall try drilling some holes at the bottom of the cylinder to see if that helps. I think if I had the strength to turn one I would go back to my old barrel tumbler; except for ease of turning I don't think I could recommend this one if using the slow method of composting. I shall try again this year and see what happens by next autumn - by then I shall be 74 .... so ...."
"I just bought a plastic tumbler made in Israel ... i put it together, and then realised with the 'aerating holes' that it bits would full out, and also attract insects and vermin. Pretty stupid design if you ask me ... "
"Composting is achieved by bacteria; Compost tumblers or containers do nothing but contain the material. Just like you can't bake a cake without the right mix of ingriedients, nor can you make compost. The average small garden cannot produce suffiecient material at any one time, so containers are just garden rubbish bins in the main. When you have a bin full of such rubbish, then is the time to make your compost! empty the bin, mix it up with some carbon (shredded cardboard is best) and some bulky material (woody prunings, bought in bark mulch etc) throw it back into your compost container, and put an old bed quilt, Duvet over the container. You'll have the best compost ever, promise." "I'm afraid I am going to give up on my ComposTumbler: as my previous comments (see 3rd October 2013, 8th November 2014) suggested I haven't been exactly enamored with it! The quality of compost remains very poor, compared with my old barrel tumbler. Although advertised as 'rust free' and 'galvenised' it is neither for after 2.5 years most of the fittings are rusting as are parts of the main drum (which is breaking up)! !I have written to Harrods, from whom I bought it, and sent photographs, they contacted their supplier who refused to do anything as it was six-months outside their guarantee, although Harrods sent tokens worth £30, a gesture I appreciated, they didn't compensate for the £270 I initially spent on it. Their supplier also said I would need to turn the ComposTumbler at least twice a day to make sure the compost rotted down properly: at nearly 75....... At the end of the year it will be put out for the scrap metal merchant who, hopefully, will take it!?" "Composting Bins Thank you, Ivan Troth, for all your advice! I have been leaning towards a tumbler compost maker, but I think I will save my money." "Very disappointed with my compost tumbler - expensive, doesn't get hot (as claimed), takes a lot, lot longer to produce compost than they claim (unless you shred absolutely everything in which case why buy this). It is plagued by a lot of large tight balls of material that you have to break up but then reappear a few days later and off you go again (and the balls smell). Plus you cannot fill it more than about half full because it is in mid-air and cannot sustain the weight through a continuous rotating process. A definite NO in my experience"
"Hi Colin, thanks for sharing your experiences on using this sort of composter. The balls are a bit of a mystery!" "Hi Ben It would seem the 'manufacturers' are aware of this problem. On the Mantis website whilst telling you they are the "Ultimate Composting Machines" under the heading "Break up large clumps by hand" they write: "While Mantis composters are easy to turn, and will mix the ingredients quite well, it may be necessary to break up some stubborn clumps by hand. If you’ve added a lot of grass clippings, they may form clumps or mats. Simply reach inside the composter bin to break up and mix any clumps. Using only well-shredded or chopped-up materials should eliminate any need to break clumps by hand, but some gardeners actually like to get a close look at their composting activity." And I don't put grass clippings in the tumbler in case you were wondering but if you can find me a solution to this problem I will be delighted "
"ROSIE P: don't give up on the idea of a tumbler altogether - my first one was a re-cycled Spanish fruit juice barrel, very similar to the Tumbleweed Compost Tumbler (rather expensive! )which was cheap but gave me a good mulch for the garden for 30 years or more!. I only changed to a Compostumbler because as I got older (I was 72 then)it became too heavy to turn when the compost sank to the bottom. COLIN B: I found exactly the same thing happening (see comments above 08 11 14 and 10 05 16) each year with no improvement - and that's how it is at present. At 75 I can't be bothered to break each ball up individually or, as they recommended to me, to turn the tumbler at least twice a day!!?? I think I'm going to try the Blackwell 330 ltr Converter: doesn't look as though much effort is involved and at £19 it's CHEAP! ALL THE BEST TO BOTH OF YOU WITH YOUR COMPOSTING. " "Forgot to say that I had wondered, opposite to Mantis, if adding a coarser material like straw might have helped - enabling oxygen to get in easier, as much of what I had used although finally shredded largely soft." "Well, it's 3 years to the month that I purchased my ComposTumble ( see above comments!). As I turned it for the last time prior to emptying it the door finally broke up - the result of it corroding badly: so much for it being 'galvanised' and 'rust free'!!!??? As even the scrap metal merchants that regularly patrol our streets wouldn't take it away (which says a lot) I have had to resort to paying the Local Authority £23 to remove it. If I was younger I think I would have taken things further with Mantis for miss-selling' but there we are ,I'm not. On second thoughts I think that the Blackwell Converter I mentioned last time would find more work than I can cope with but I am wondering if one of the Worm Compost Bins would be worth trying, it might not take all of my kitchen waste but it would be better than nothing: I' leave it now until the winter has passed as the worms are unlikely to be active through the cold weather. I'll let you know how it goes!" "Well I am inclining towards simplicity, it is surprising how often if you just throw or shovel some garden waste in a bag or drum or even on the ground in a quiet corner nature seems to very quickly produce some excellent organic matter that can always be put to good use. " "Hi...I'm new to composting, and bought a Miracle-Gro brand tumbling barrel. I really enjoy the process, but I'm worried that my mixture is too cold. I started loading up the barrel in the early spring, and I tried to be careful about starting with mostly brown materials like shredded leaves and dried grass from the previous year, collected from a meadow (I probably should have shredded this more than I did). Over the last month or so I have added pulp/fiber from my juicer, plus other vegetable trimmings. I turn the barrel a few times every two days. Some of the pulp seems to "disappear" pretty quickly, other but other parts clump up in golf ball sized bits, and seem to stay in their original form. The whole mass of material has decreased, seems to be turning into something, has turned brown and a bit syrupy, but I still see some leaves in there, too. As I mentioned before, it has never gotten warm or hot....it's still cool outside here in Minnesota, still hasn't gotten much above the 50s most days...and I only get sunshine on the barrel in the morning. I'm wondering if anyone has any thoughts...does it sound like I'm on the right track, and have to be patient with it, or should I be adding some more brown materials to dry it out and such? Thank you! " "I bought a Mantis Compost Tumbler about 15 years ago. It is finally starting to have rust holes. I purchased a new one, but I'll still use my old one after lining it with screening material. It's very surprising to see that many people have had problems with Compost Tumblers not lasting. I love it because I have vermin problems and back problems. No, it doesn't make compost quickly, but it saves the landfills from filling up with food waste and I don't mind waiting for compost. It's like money: it's useful no matter when I get it!" "My neighbor who is moving offered to sell me her Mantis compost tumbler for $50 - do you think I show buy it? I have 2 bins but do have trouble turning esp with the roots that grow in them." "Lisa, YES, I think you should buy it! Read my post above." "Hi everyone, do check "The Jora Compost Tumbler"- One of the easiest to use and the most efficient waste tumbler composter ever made. Compost Tumblers to fill a need for a composter that could work all year around. You can use Jora Composters to compost harder materials like fish and small chicken bones, avocado and peach pits etc. Best Composters on sale at affordable pricing!" "I have found this site instructive. I "inherited" my Sun-mar compost tumbler from a neighbor who moved out of state. I don't understand how the tumbler material can heat up enough if we are constantly interrupting the bacteria by tumbling it and breaking up the cultures. And I too have problems with the "balls" of material forming, which I break up by hand. " "I have two tumblers with a third on the way. One is a lifetime tumbler, I got for cheap, hard to turn when fuller, but is doing a good job composting even during winter(in Wyoming) I keep it on the patio on the south side of the house. the other is a dual chamber tumbler I keep in my green house, it is doing well, gets 100 degrees in the greenhouse even when its 25-30 degrees during the sunny days. I just got another one I haven't picked up yet, for free, from people who thought they were going to make their own compost, but got tired of it. This new composter has the turning handle which I'm excited to use. Tumbler composting takes time, but keeps the yard tidy looking and I have three tumblers to fill to use in my vegi greenhouse and my flower beds. This is my first year of composting and will have a learning curve I'm sure, but it's been fun, and my co-workers are interested how it's working, so I might be encouraging more future composter's . Garden On!" "That's great to here Dave. Keep up the good work!" "I am in a S.T.E.M class and we are learning about compost bins and which one is the best. I have a project over what type of compost bin is the best and we have to explain why we chose the certain compost bin. I chose the compost tumblers. Is there any other pros of having a compost tumbler other than the information given above?" "Hi Ryan. The main pros listed above are the main ones for a compost tumbler."